Completely redecorated in April 2015. This is a privately owned condo, not corporately owned. We will keep this unit up to date, as if we'll use it ourselves.....which we will. Corner Condos in Crystal Tower are the way to fly. We have 2 balconies with views of the Gulf and The Little Lagoon. Crystal Tower is a fantastic new building in Gulf Shores-- it is one of a kind with the only resort-style pool + lazy river on the island. The Beach Club is directly on the Gulf of Mexico with an air conditioned walkway leading to it directly from the building. Hit a button to the elevator, take a short stroll and viola--the choice is tough--the palatial resort pool or the sugar white sand at the beach? The view from our unit is pure white sand at the Gulf to the south and the Little Lagoon to the north. You are literally in an oasis surrounded by aquamarine blue water and white fluffy sands. Our condo boasts new furniture (we just finished it in April, 2015) with custom king bedding, and high end furnishings. You will feel warmth and personal touch in our home away from home. Both bedrooms have been equipped to be master suites...both with king sized beds, curved shower curtains and balconies. Yes, even the 2nd bedroom boasts it's own private balcony with a gorgeous, unobstructed view of Little Lagoon. While our actual condo is not directly on the beach, it is about 100 yards from it, but the footprint of the building is larger which enabled the developer to stack it with amenities that no other building has. 3 on-site pools (one true indoor with fountains--great for rainy days) and two outdoor, both with hot tubs. You will feel you are in heaven when you take a dip in the pool with a lazy river. The lazy river was designed after a similar one in Bali where the developer loved to vacation. There is also a media room which you can reserve in advance at the front desk. You can have family gatherings there--potlucks, small parties. We have security or management on site 24/7. 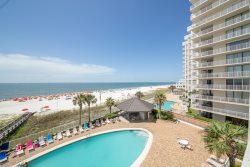 This building is ideal for families who are looking for all of the views of a gulf front unit, gulf front access to a private beach, and amenities galore--but not gulf-front price. Granite in the kitchen and both baths, fantastic Travertine floors. Two High-style Adirondack chairs and a rocking chair made of recycled milk-jugs on main balcony promise a comfortable time soaking in the gulf air. We promise you'll love our condo.